Do You Want to Spend Less to Stay Warm This Winter? Read This Now! As current trends analysis shows, fuel costs have been steadily rising as each winter passes, especially in Ontario. So unless you fancy a winter spent chopping up your own wood, you can expect that once again, you will be at the mercy of whatever the energy companies decide to charge for heating fuel. But this doesn’t mean all hope is lost for controlling against skyrocketing winter heating costs! There are still some powerful things you can do to ensure you get the most use out of your heating equipment and the energy you purchase to run it this winter. Even better, some of the things you can do to save money on heating expenses can also help improve your indoor air quality this winter. Winter, with its dry air, short days and traditionally high end-of-year holiday stress, can be a particularly difficult season for staying healthy. In this post, we show you what to do to lower this winter’s heating costs, improve your indoor air quality and feel better all winter long! When it comes to getting the most use out of your heating fuel, you can’t do better than recruiting a heat recovery ventilator as your cost-cutting sidekick! What does a heat recovery ventilator do? The clue is in its name. A heat recovery ventilator (sometimes also called an energy recovery ventilator) extracts escaping heat from your exhaust vents and uses it to heat the fresh incoming air. This handy appliance can be retrofitted to work with any existing central (ducted) HVAC system. Your HRV recaptures heat in a very unique way to make sure no stale air sneaks back into your indoor air supply. The incoming and outgoing air conduits are completely separated from one another so the two air supplies never mix. The heat recovery ventilator simply transfers the captured heat to the heat recovery core located in the center of the unit. This captured heat then pre-heats the incoming cold fresh air, so your furnace doesn’t have to work as hard or expend as much energy to accomplish the same task. 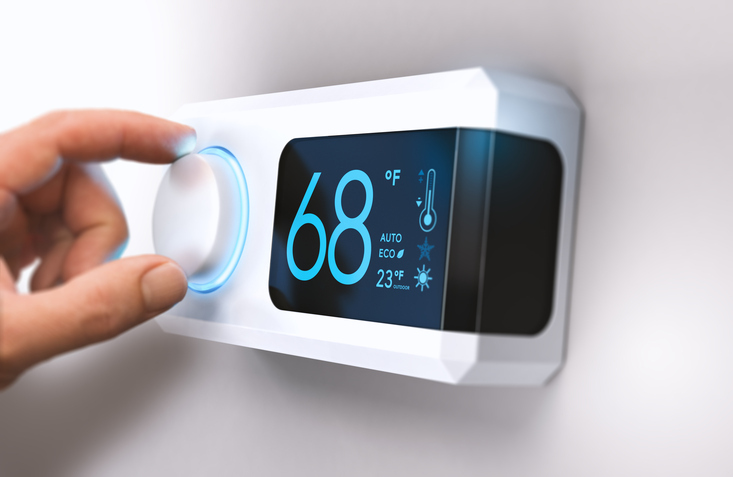 This can translate to some significant energy savings as winter temperatures plunge! While the heat recovery ventilator is masterful in how it saves you money on heating fuel, its original purpose was to provide ventilation in air-tight homes and workplaces. The fact that the heat recovery ventilator can save you money on winter heating bills is just a bonus (as is the way the heat recovery ventilator reverses itself to save you money on cooling costs come summer). The primary purpose of a heat recovery ventilator is ventilation. Those two separate airstreams we mentioned in the previous section here—one for fresh incoming air and the other for stale outgoing air—operate continuously to recycle the air inside your home or workplace. The continuous balanced operation between the fan pulling in fresh air and the fan pushing out stale air can also help keep indoor air quality balanced and remove radon from your indoor air supply. The heat recovery ventilator is most effective for this purpose when installed on lower levels of your home. This means you will never be at risk of breathing in toxic, polluted, poorly oxygenated air inside your home or office. Your heat recovery ventilator will be continuously renewing your air supply, keeping you healthier all winter long. As if saving you money on winter (and summer) energy costs and ventilating and refreshing your indoor air supply isn’t enough, the heat recovery ventilator has still a third feature: it can balance your indoor air humidity levels! In many parts of the country, summer brings extremely humid air while winter offers up harsh, dry air. Sometimes, such as when severe weather rolls in, this process gets reversed. In either case, the only typical recourse you have is to either add a humidifier or dehumidifier or adjust your thermostat to try to keep your indoor humidity levels bearable. The heat recovery ventilator takes this job off your hands! The heat recovery ventilator can easily pull excess moisture out of the air as needed to keep humidity within the 30 to 50 percent range recommended by health experts. Have a certified contractor perform your annual maintenance and safety check. Schedule this service to coincide with your annual furnace maintenance if possible. Clean the unit itself every three months. Change the filters every one to three months as needed. Leave your heat recovery ventilator running at all times unless it is being serviced. The heat recovery ventilator you choose for your space should be Energy Star-rated. This ensures ultra-efficient operation that saves more on fuel than it draws. We are proud to offer two exceptional heat recovery ventilators: a professional model and a deluxe model. Both models are Energy Star-rated and come with generous warranty coverage. The size and configuration of your space at home or work can determine which model is a better fit for your needs and budget. Here at CleanAir Solutions Hamilton, we are passionate about providing our residential and commercial clients with indoor air quality solutions that promote better health, productivity, peace of mind and quality of life! Contact us online or give us a call at 905-544-2470 to learn more about indoor air quality and how a heat recovery ventilator can save you money this winter season.